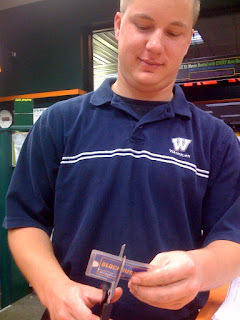 bknelson052173: They cut up my Blockbuster card! Look at the smirk on his face. And it was his first night on the job. Blockbuster will get involved in card cutting wars. I'm currently taking donations - anyone have an unused Blockbuster card?